Lauren officially joined the cosplay circuit at FanExpo 2000 and has been hooked ever since! She is a Toronto-based master-level costumer and prop-maker whose adoration of immaculate detail has won her many awards and lost her a good chunk of her sanity. 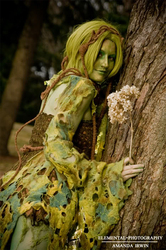 Her costume work has been shown at the Ontario College of Art & Design, the Lennox Contemporary Gallery, the One of a Kind show, and has been featured in Vogue Patterns magazine. Lauren's costume specialty is ornate, fantasy-based designs - the more gravity-defying, the better!